The launch ceremony was attended by Ethiopia’s prime minister Dr Abiy Ahmed, African Union chair Moussa Faki, government ministers and Ethiopian Airlines Group CEO Tewolde GebreMariam. GebreMariam noted that with Addis Ababa overtaking Dubai as the largest air transport crossroads between Africa and the rest of the world, the terminal was further evidence of Bole Airport’s growth as one of the largest and most convenient global aviation hubs. 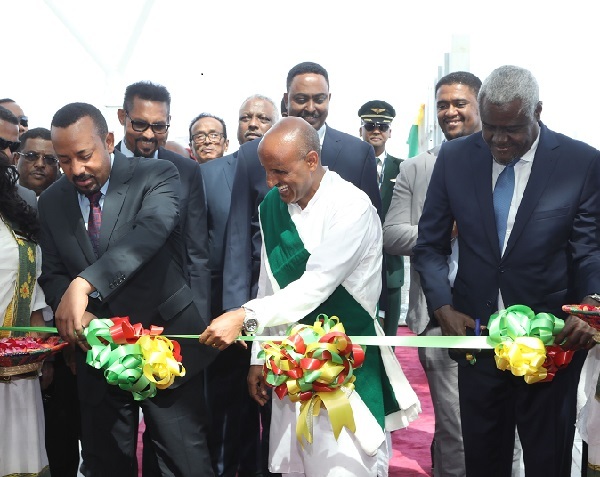 “The new US$363m (about £280m) passenger terminal will help to serve the huge increase in volume through and into the airport driven by its strategic location and Ethiopian Airlines convenient connectivity options,” he added. The airport can accommodate 22m passengers annually thanks to an additional 86,000sq m in Terminal 2, 16,000sq m in Terminal 1 and 6,000sq m for a new VIP terminal. Next to the airport, the airline-owned Skylight Hotel houses 373 guestrooms and executive suites, four restaurants including the largest Chinese restaurant in Africa, two bars, five meeting rooms and a 2,000-capacity conference hall.